I came accross this online ship Muzungu Sisters when reading a magazine in Spain. Its the labor of love of two friends, Dana Alikhani and Tatiana Santo Domingo. The online shop is relatively new and stocked with beautiful and exclusive pieces hand crafted from around the globe. I'm in love with the black velvet jacket, the work one one of the most tanlented tailors in Morocco. 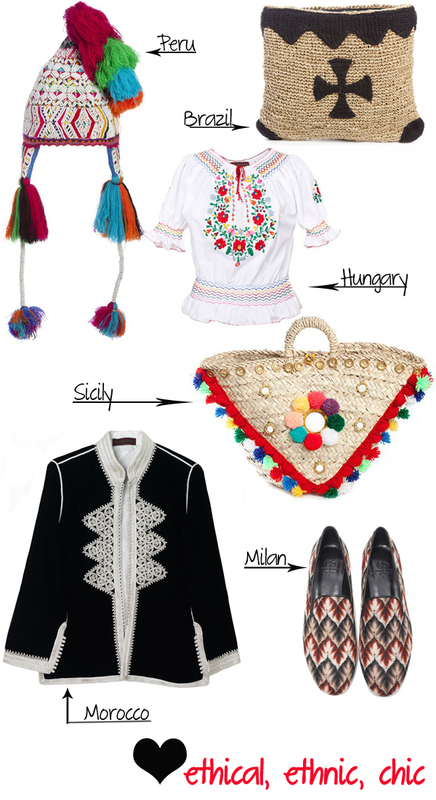 And how about the adorable Hungarian top?! It screams summer- this is a traditional blouse hand-embroidered by a third-generation embroiderer in the countryside just outside of Budapest. What about the straw tote?! and the cute winter hat? All chic and unique for sure. what do you think? Do you like the ethnic-chic and ethical items here? That girl has not just taste in men but also clothes... Haha! The top from Hungary is gorgeous...wish I knew if its length would fit me! I'm not usually for ethnic clothing, but these have a touch of luxury, which I dig. =) Good find! I love all of them, but I don't think I could rock that hat.